For our anniversary, I painted my toenails pale blue, the same color they were on the day we got married. Today, to celebrate, we both took the day off and drove to Maplewood, our old stomping ground and the place where we met, to wander around and be tourists. It was pretty fun. 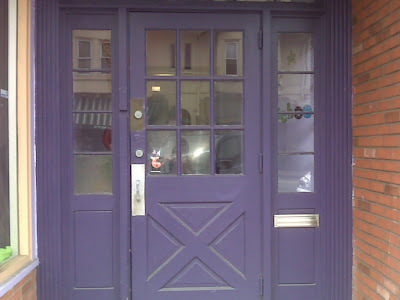 Here's the door of the building where we first met, first talked and asked/accepted a first date. After the sentimental reminiscing we went to a brand-new place in town called the St. James Public House, an excellent Irish Pub, where we enjoyed a very memorable lunch. At the outset, our waiter tripped and threw cosmopolitan martini over the table, the menus, our phones, and my white sweater. During, the number of screaming children/loud talkers grew with each quarter hour, and at the end we were pretty sure that our waiter had accidentally thrown away my leftovers after he took the plate back to the kitchen to wrap it up. Luckily (for him), that wasn't the case. All in all, it was a pretty delightful day and an excellent way to celebrate our fourth anniversary. That's such an awesome day!!! Except the part where drinks were spilled all over. But it does make a good story! So who was the asker for the first date? So glad you enjoyed time together! What a great day you had! And you made new memories - ones not quickly forgotten, I might add. happy anniversary belately!